LightStream is actually a part of SunTrust Bank but you don’t need to be a member to apply for a personal loan. The company focuses on borrowers with excellent credit and a robust credit history. It’s not the best option if you have a low credit score or even no credit at all. But if you have a strong history of timely payments, LightStream could be a good fit for your next personal loan. One of LightStream’s differentiating factors is that it offers hyper-specific loan categories. While you can get a personal loan for just about anything, the loan’s purpose affects your interest rates based on the risk involved. A debt consolidation loan, for example, would be deemed riskier than a home improvement loan, and therefore would come with a higher interest rate. It’s an interesting lending model that rewards borrowers who want to finance value-added purchases. LightStream is not one of our top picks for 2019. Click the link below to see which companies we think are better. LightStream personal loans range from $5,000 to $100,000, which is one of the higher loan limits available among online lenders. Loan terms can last anywhere between two years and seven years so you can get quite specific with the exact loan terms you’re looking for. All personal loans through LightStream are unsecured, meaning you don’t have to use the purchase itself or any of your other assets as collateral. Interest rates vary based on your loan amount and the length of your term. The following chart depicts the fixed interest rate range for each loan amount based on the length of your the repayment term. The rates listed here reflect enrolling in LightStream’s autopay program. If you elect to pay your bill manually each month, your interest rate automatically increases by 0.5%. LightStream doesn’t charge any fees associated with your loan, so your fixed rate is the same as your APR. LightStream reports payments on loans to all three credit bureaus. Be sure to pay your loan balance on time each month to avoid any late payments being listed on your Experian, Equifax, and TransUnion credit reports. LightStream is very strict with its lending standards and only approves individuals with excellent credit. The minimum credit score is 660. Your length of credit history should be at least five years. Additionally, you should have a diverse credit mix, such as credit cards, mortgage, and/or a car loan; however, your debt to income ratio must be low, so while you should use credit regularly you must not rely on it too much. LightStream also wants to see that you have the ability to save money, but even a retirement plan can count for this category. Finally, you’ll need to indicate a strong history of positive payments to prove that you’re willing and able to make your new personal loan payments. Start off by navigating to the type of loan you’d like to take out. LightStream provides dozens of categories and subcategories, such as landscaping loans in the home improvement category or adoption loans in the family category. Once you’re ready to apply, you’ll first have to agree to use electronic methods for all of your loan communications. You also have the opportunity to select a joint application if you’re applying with a spouse or domestic partner. From there you’ll create a login account and begin the application process. Unlike many other online lenders, there isn’t a pre-approval process. Instead, LightStream performs a hard pull on your credit report from both Experian and Equifax before offering your loan terms. After inputting your financial information, be prepared to upload documents verifying both your identity and your income. Within a few minutes of fully completing the application, LightStream notifies you of whether or not you’ve been approved. At this point, you’ll also find out the exact loan terms you qualify for, including the loan amount, length of term, interest rate/APR, and your monthly payment amount. If you agree, you can then accept the loan terms and sign the loan agreement online. You may also choose the date you want to receive the funds, as long as it’s within a 30-day window. You can receive your funds from LightStream as quickly as the same day you sign the agreement, provide your bank account information, and have the information verified. All of these steps must be completed before 2:30 p.m. EST on a business day. LightStream seems to stay true to its word on charging no fees. If you’re late on a payment, your interest simply accrues on a daily basis rather than being charged a set late fee or percentage of your overdue payment. One perk specific to LightStream is that the lender offers a $100 customer satisfaction guarantee. If you’re unhappy with your experience after receiving your loan, you may fill out a questionnaire and receive $100. Many borrowers appreciate that you can utilize a co-signer with strong credit on your loan application as well as apply for joint loans. This benefit gives you a little more leeway in the approval process if your credit is less than excellent. That being said, there are a few restrictions on LightStream loans. Remember that you can only use your loan money for the purpose stated in your original loan application. Also, LightStream does not offer student loans or financing for higher education. You can, however, take out a loan to finance Pre-K through grade 12. 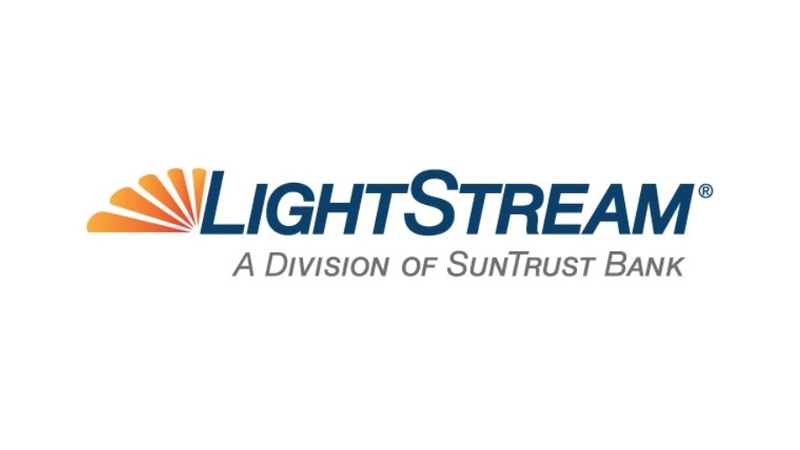 LightStream is a division of SunTrust Bank and focuses solely on online lending. Using its online platform, LightStream has created a completely electronic lending process. SunTrust’s assets total $191 billion, meaning LightStream is funded by a large financial institution rather than a team of investors, as many other online lenders are. It’s a very different set-up from most other “disruptor” lenders, so it’s really up to you whether you see this as a pro or a con. Not all personal loans are created equally, so make sure you have a firm understanding of what you need and what you can get before you start applying. Here are a few considerations to keep in mind when applying for a LightStream personal loan. Part of your loan agreement with LightStream is that your loan funds can only be used for what you originally said they’d be used for. You can’t change your mind or use some leftover cash to pay for a vacation if you’re supposed to be financing your child’s private school tuition. That means you need a fairly exact budget of what you’re going to spend the money on and how much you’ll need. If you end up having extra funds leftover, you can always repay a larger portion of your balance early. After all, you’ll end up saving money on interest in the long run and there are no prepayment penalties. LightStream caters to borrowers with good to excellent credit. If you haven’t already, take a few minutes to gain some self-awareness and check your credit reports to see where you lie. If your credit report is free of delinquencies and late payments, and you’ve had some type of credit account for at least five years, then there’s a pretty good chance you’ll qualify. Yes, LightStream only caters to people with excellent credit. If that sounds like you, then great. But remember that it’s best to compare rate offers from multiple lenders before choosing one, no matter how good your credit score is. This is especially important if you want to take out a personal loan in a higher risk category. Because LightStream varies interest rates based on the type of loan in addition to your credit and income qualifications, make sure they’re on par with other terms you’ve been offered.